The Himachal Pradesh Chief Minister Virbhadra Singh participated at the concluding ceremony of two-day long traditional ‘Anokhi Dali’ fair at Jubbarhatti, near Shimla today. While addressing the gathering, Chief Minister Virbhadra Singh said that the fairs and festivals were symbol of rich cultural heritage of the State and Government was committed for preserving this heritage for the future generations. 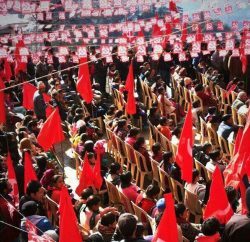 In his address, he stated that 60 new middle schools and five senior secondary schools had been opened in the Shimla Rural constituency. He said that better infrastructural and adequate staff facilities had been provided to the government schools, despite the people as well as government school teachers prefer sending their wards to private schools, which was not in a better taste. He added that in future, the educational institutes would be opened or upgraded as per the need and number of students, though relaxation could be given in difficult areas. Virbhadra Singh said 24 roads would be widened in Shimla Rural constituency by approximately Rs. 100 crores and a dental college and shooting range would also be established at Nehra in Shakrah Panchayat. He said the second campus of the H.P University would also be established in this constituency. Chief Minister also assured to tale the matter regarding development of Shimla run way at Jubberhatti with the Airport Authority of India. 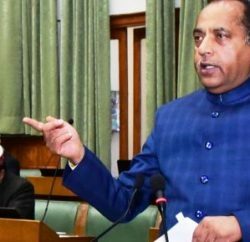 He said that state government had developed Jubberhatti run way at its own resources and later handed it over to the Airport Authority for operation. The flights on this Airport were not being operated since last one year as the concerned Airline had closed its services whereas Air India and other airlines with bigger aircrafts can not land here as they lack facility of smaller jets. He said that if Airport Authority refused for expanding the airstrip, then State Government would do the needful through its resources. Chief Minister said he had laid foundation stone of Katasani cricket stadium near Jubberhatti during his previous term but BJP government took no interest in constructing the stadium and funds allocated were diverted elsewhere. He urged the local people to come forward in providing land voluntarily so that the government could develop a multi-purpose sports stadium at Katasani. He also distributed prizes to the progressive farmers and winners of various sports competitions. 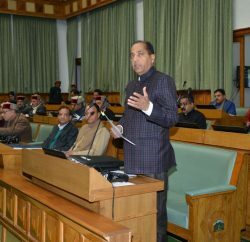 Mukesh Agnihotri, Industries and Information and Public Relations Minister said that the people of the constituency were fortunate enough as Chief Minister was representing this constituency. This would ensure speedy development of the constituency and people would get various facilities nearer to their homes. He said that Rs. 1000 crore Swan River Channelization Scheme had been started in Una district and an IIIT was also being established at a cost of Rs. 122 crore in his home assembly segment. Agnihotri said that a grand function would be organized at Hamirpur on 25th December, 2013 to commemorate the completion of one year of the present State Government. Pramod Sharma, Chairman of the Anokhi Dali Committee welcomed the Chief Minister. Exhibition based on agriculture and floriculture produce were also organized during the fair. The Mela organizing committee also arranged free health check-up camps and distributed free medicines and spectacles to the needy patients. Sanjay Chauhan, Mayor, Shimla MC, Tikender Panwar, Deputy Mayor, MC Shimla, Subhash Manglate, Chairman, H.P. Agro Marketing Board, Sohan Lal, Ex MLA, Atul Sharma, Vice Chairman, HPSIDC, Brij Lal, Chairman, Kailash Federation, Mahender Stan, Chairman, Shimla and Kinnaur APMC, T.G. Negi, Advisor to Chief Minister, T.C. Janaratha, OSD to Chief Minister, Dinesh Malhotra, Deputy Commissioner other Pradhans and Up-Pradhans of nearby Gram Panchayats and prominent persons of the area were present on the occasion.